After man of the match performances against Exeter Chiefs and Wasps, as well as nine tries to his name already this season, there was a quote from Alex Dombrandt which stood out. “I guess it’s now realising that it is happening and it is about trying to improve week on week,” said the 21-year-old in a recent interview with TRU. You cannot argue with the attitude Dombrandt expresses, but what could be disputed is his absence from Eddie Jones’ England squad for the upcoming Guinness Six Nations. The Cardiff Met graduate has not been included by Jones, which may have come as a surprise to some after his eye-catching displays for Harlequins during his maiden season at senior level. Dombrandt could be seen as the form No.6 in the Gallagher Premiership after his consistently solid performances, but Jones has opted for reputation as well as those players who delivered for the Red Rose during the Autumn. 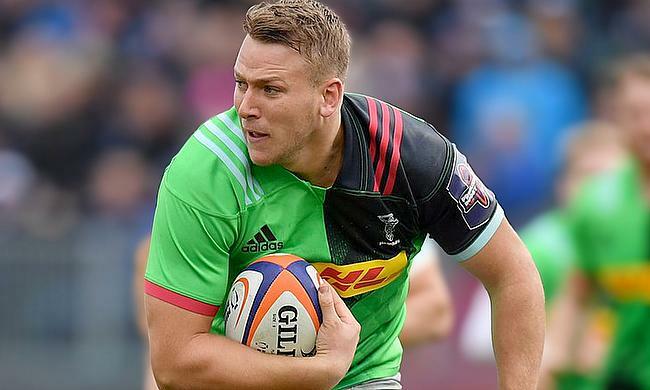 The likes of Brad Shields and Mark Wilson will be aiming to continue their form for England as they set their sights on a World Cup place, but for Dombrandt, the immediate focus is on Quins. BREAKING | Your England squad for the 2019 #GuinnessSixNations ?? It isn’t a shock to hear that Dombrandt is delighted. His presence and explosiveness on the field has only enhanced his reputation and it is continuing to grow as each week passes. By his own admission, he is surprised at the rate at which he has progressed considering the towering forward was playing rugby for his university less than 12 months ago. Dombrandt was one of the main figures during his time at Cardiff Met as the Welsh university stormed to the BUCS Super Rugby Championship final at Twickenham back in April. His man of the match display helped Met fightback against a strong Hartpury side, but ultimately, there was to be no swansong for Dombrandt before moving to Quins. Dombrandt is now one of an increasing number of current Premiership players who have come through the university rugby route and these athletes are showing their quality at the highest level. Exeter’s Sam Skinner and Tom Lawday, as well as Bristol Bears scrum-half Harry Randall, are recent examples of graduates from the BUCS system and it is a pathway which is becoming more fruitful. “If you look at it, it [BUCS Super Rugby] is the perfect route to go down,” Dombrandt added. “I have got a degree in my back pocket and now you are living the dream as a professional rugby player. Before Dombrandt had completed his Sport and Physical Education degree at Cardiff Met, he had already agreed a deal with Harlequins, but while he was preparing for his move, his new club were also making alterations of their own. In April, Harlequins announced Director of Rugby John Kingston would leave the club by mutual contest and his replacement was England defence coach Paul Gustard. At present, the decisions made by Quins have been vindicated. The club are going through a purple patch. They currently sit third in the Premiership table and they are top of Pool 5 in the European Challenge Cup. Gustard has also not been afraid to give youngsters, such as Dombrandt and Caden Murley, a chance to showcase their talent and it has provoked a positive reaction, especially from the former. “The environment that we have got now is a very positive one and one all the boys are buying into,” said Dombrandt. “At the end of the day, we want to take Harlequins back to winning trophies. He [Paul Gustard] has said that and the boys are working hard to try and achieve that. There is no denying that the ‘Dominator’ (the nickname given to Dombrandt at Cardiff Met and now used at Quins) is one of the rising stars of the game. The ‘emerging talent’ tag is something many young players are branded with at one stage or another, but the talk which has surrounded Dombrandt regarding England, particularly in a World Cup year, has just made him standout from the rest. Yes, the Six Nations may have come too early for him and perhaps a seat on the plane to Japan is just out of his reach, but if Dombrandt maintains his high standards, a chance with England may come his way.